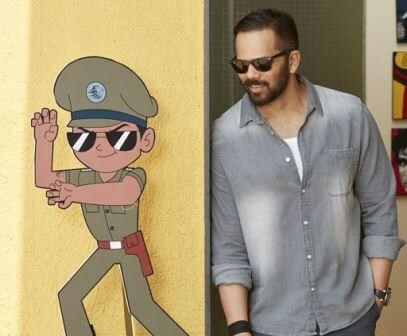 #RohitShetty launched animation series #LittleSingham, in collaboration with #DiscoveryKids, #RelianceAnimation and #RohitShettyPicturez here in Mumbai. During his media interaction, the filmmaker expressed that animation series is 100 times larger than the real Singham. Rohit Shetty is known for his comic-action drama and super hit franchises like Singham and Golmaal, the filmmaker also admitted that he has an aspiration to make “Kids” movie with kids. Little Singham is inspired by the Ajay Devgn starring superhit film series. An original kid’s content series in India will be aired in 4 languages- English, Hindi, Tamil, and Telugu. Discovery Kids, Reliance Animation and Rohit Shetty Picturez collaboration ‘Little Singham’ will air on television in April 2018.